Over the last year, I’ve pretty much stopped using store bought sides. Boxed pasta and rice is easy, and it’s pretty good, but I’ve come to prefer homemade. Especially when I can find fast or easy recipes. This recipe isn’t fast, but it’s relatively hands free. 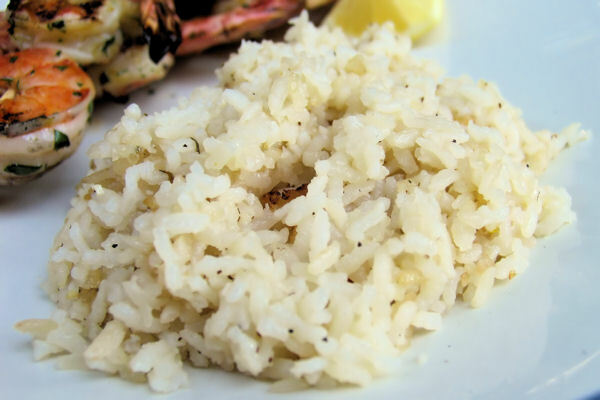 You bake the rice in the oven, and only have to stir it once or twice as it cooks. How simple! It does take an hour or so to bake, but that gives you time to make all the other components of your meal, and at least you know that your side dish is taken care of. The garlic isn’t overly powerful, and the addition of lemon at the end gives it a nice burst of freshness. This has become one of my new go-to side dishes, and my husband and I love it. On a side note, this recipe works well with medium grain rice, seeing as how I never have long grain rice… Whoops. In a saucepan or skillet, melt the butter over medium-high heat. Add the garlic and rice to the pan and cook until both are golden brown, about 3 to 4 minutes. Stir in 1 cup chicken broth, salt, and pepper and bring to a boil. Pour the mixture into a casserole dish, cover, and bake for 25 minutes. Stir in the remaining 1½ cups chicken broth and bake, covered, for another 30 minutes. Stir in the lemon juice, then finish baking for another 15 minutes. Fluff with a fork or spoon and serve. This looks great. I agree, no need for store-bought sides, so salty!